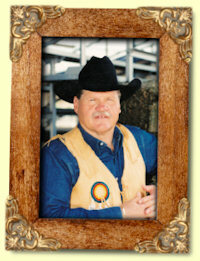 Zeb Bell joined the PRCA in 1973 after three years in the amateur ranks. He has been the "Man Behind the Mike" at major rodeos all across the Untied States and has been invited back to every rodeo he has announced. A microphone has been part of Zeb's "WARDROBE" for years. In the early '70's, Zeb was one of Idaho's best-known radio and sports personalities. Today, Zeb hosts a television talk show "Hoof Beats", from Twin Falls, Idaho and does voice work on commercials and videos. Along with his announcing career, Zeb has a promotion company, "Chute 2 Promotions". 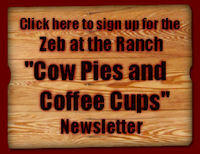 Zeb also has a top rated talk show on ABC radio called "Zeb at the Ranch". He and his lovely wife, Deanne, a former barrel racer, live on a small ranch south of Murtaugh, Idaho where they raise corriente cattle and team rope in their arena. 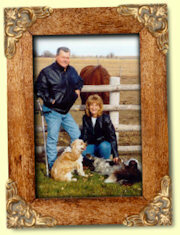 They have two children; Jake is married and is a fireman in Boise, ID and Tobee Jo is married and farming in the Murtaugh area. Despite the fact that Zeb is on crutches stemming from a bout with polio and numerous accidents, he is an active team roper when not busy informing rodeo fans about the arena action. Zeb also receives praise for his motivational speaking. When Zeb talks people listen. He truly has a gift for generating new enthusiasm in adults and young people. Zeb is both a vibrant and spirited speaker that any audience can appreciate.